Yes yes yes! I know it has been a long time, like over a month, since I last updated the Homeskillet. Look, we / I have been very busy and totally distracted. My wife, She-Ra, just got promoted to manager at her job and is preparing to leave for a month to get trained. Our property managers want to move us to a new location so they can rip out our roof and replace all of the longtime monsoon and severe summer damage as leaking has begun. I have a full time day job. 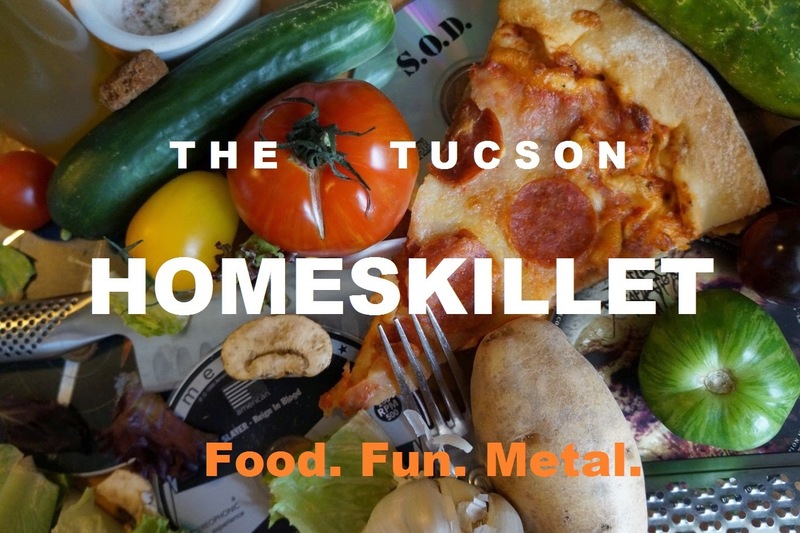 I am the food writer for the Tucson Weekly. Sometimes now and then I do like to get some sleep and take in a movie. 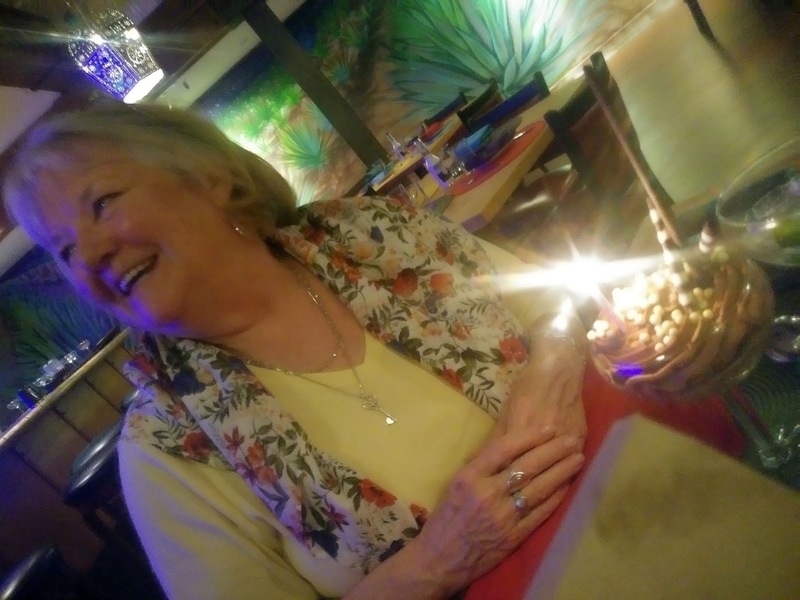 Well, recently my mom visited us from the sovereign state of Delaware to escape the cold and celebrate her 71st birthday in Tucson. With that, I decided to do a fun project and photograph everything my mom ate while visiting us for almost a week. Thing is, I missed a few, such as breakfast at the Old Times Kafe, because we were about to take her to her first Marvel movie, Black Panther, and lots of nerdy catching up and informing was going on. Plus there was the myriad of snacks in her hotel room, such as fruit, crackers, nibbles and so forth that, you know...c'mon. Not that interesting right? So in order of appearance, here is everything my mom ate in Tucson from March 14 - 20! Since my wife works at Old Chicago its kind of a tradition to bring my mom by there when she is on shift for a quick bite. 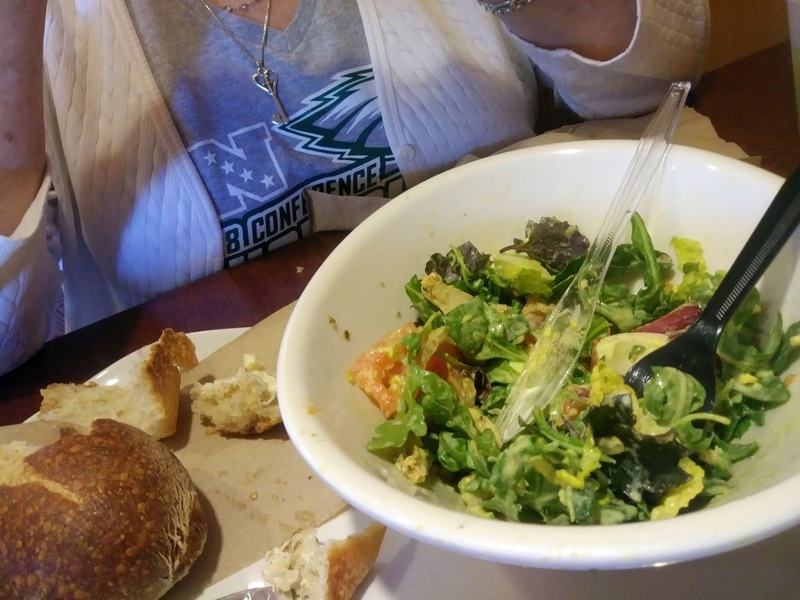 Mom loves the chopped salad, which features bacon, applewood smoked chicken, blue cheese, avocado, tomatoes over greens and finished with a creamy herb dressing. I was so caught up with catching up that I didn't get the full salad in all of its Old Chicago glory. So here is the end result. She ate the whole thing! 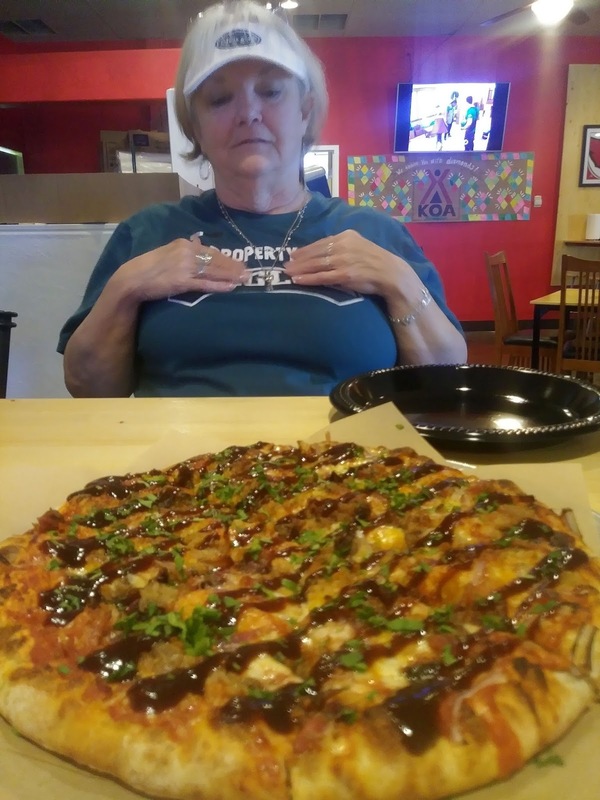 And mom prides herself on not eating a whole lot these days. She's even dropped a few pounds. Way to go mom! Lets be honest here: Guadalajara is...fine. Its okay. Its there when you need it and fills you up when you are in a pinch. We were in a bit of a pinch. Plus its the kind of Mexican restaurant that parents from eastern territory without real Mexican cuisine always seem to enjoy. Mom got the chicken quesadillas, which were....fine. The table side salsa, I will say, was really good. Fresh ingredients, a nice heat, served up chunky and lots of it. I think I got some kind of combo plate but ended up eating most of the chips and salsa. I think She-Ra got soup. Ah, pre-downtown and 4th Avenue exploration meant a visit to the Cup Cafe in Hotel Congress. Now, we haven't been to the Cup in quite sometime so I was pretty excited to eat there. 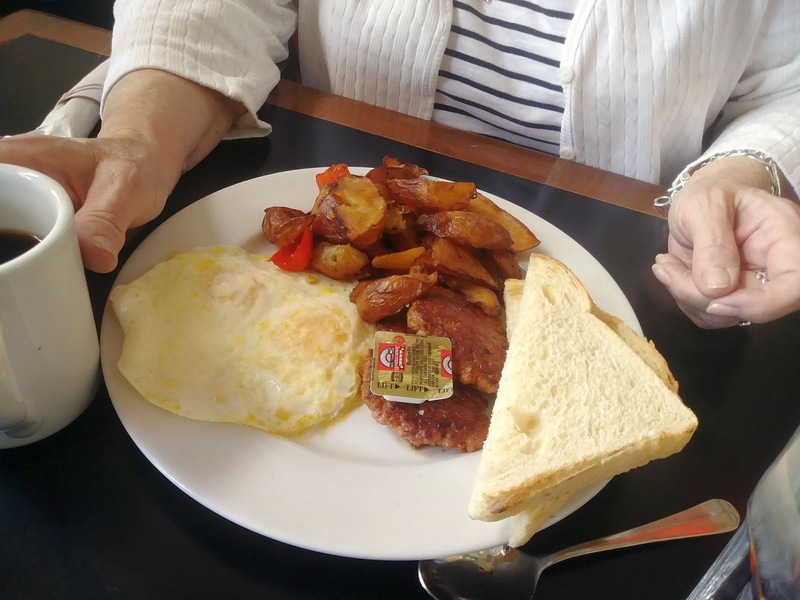 Mom got the eggs, house potatoes, white toast and housemade sausage plate. The potatoes were a bit mushy but her sausage was good and the egg was cooked perfectly. Plus the coffee was nice and strong. She liked that. I got the huevos rancheros and they were pretty darn tasty. I think She-Ra got soup. As much as we wanted to eat local as much as possible the convenience of a place like Panera was there when we needed it. 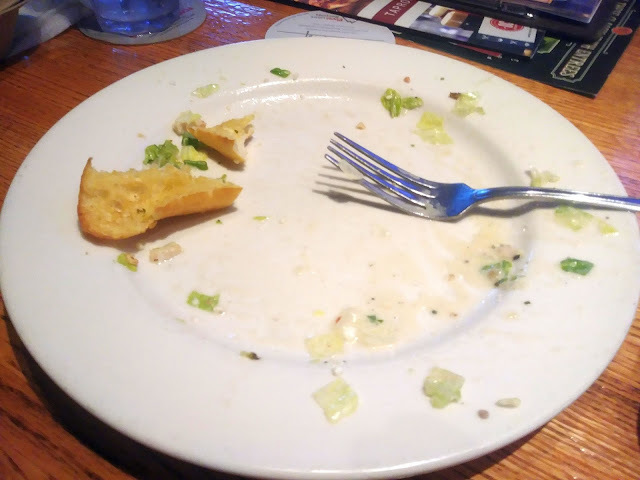 It was easy, its familiar and, honestly, I just wanted a salad. Which is what my mom got. I think she ordered the green goddess cobb, which was lovely she said. I got a turkey sandwich with a side salad and the side salad was huge. So half of that sandwich came home with me. Ah Danny's. Our ubiquitous hangout. Home away from home as it is. Before sending my mom back to her hotel room we popped in for a drink. 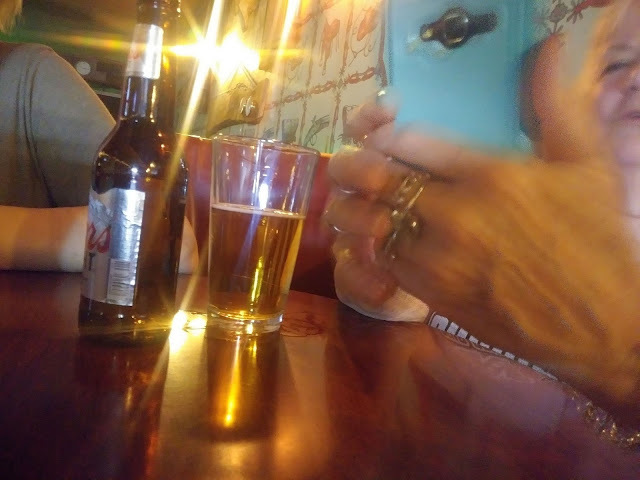 Mom got a Coors Light in a chilled glass. We got our usual vodka and sodas. My buddy Michael Elefante, chef and co-owner of Mama Louisa's Italian, has been asking me to bring the wife in for dinner sometime for a while now. Well when my mom arrived I asked him if you can make it a table for 3 and he set us up! Mike is now serving up pizzas so he sent out a mushroom and pancetta topped beast. It was delicious. The dough is thick but fluffy with a perfect ratio of fresh mozzarella. We each had one piece knowing our entrees were going to gut bomb us. 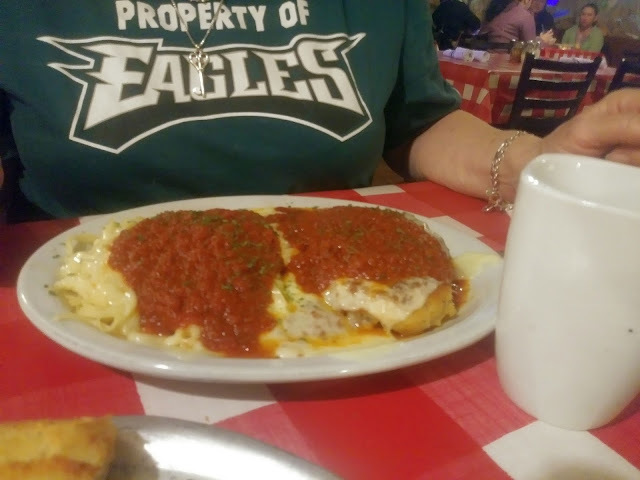 Mom got the chicken parmesan and generous doesn't even describe it. Mom could only finish the chicken part so the pasta portion came home with her to the hotel. She loved it. She-Ra ordered the linguine and clams in white sauce. Mikey insisted I try his Italian Ramen, so I did. Unreal. So much food that it all came home in to-go boxes. 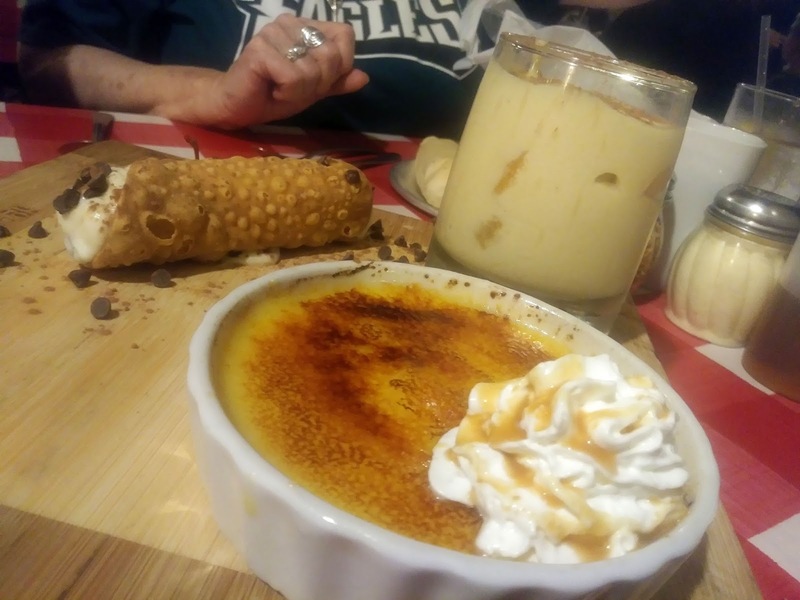 Even though we were packed in, Mike treated us to a dessert trio of cannoli, tiramisu and creme brulee. Outstanding. For me the standout was the tiramisu which was served in a heavy tumbler and created with lady fingers, espresso, coffee liqueur and marscapone. For my mom, she loved them all. She-Ra dabbled as her pasta dish wrecked her for eating in quite a while. But in a good way. It was an absolute beautiful day and the only thing we could think of was dining on a patio. Seeing as mom hadn't been on University Ave. in a few years, we decided on Frog & Firkin. 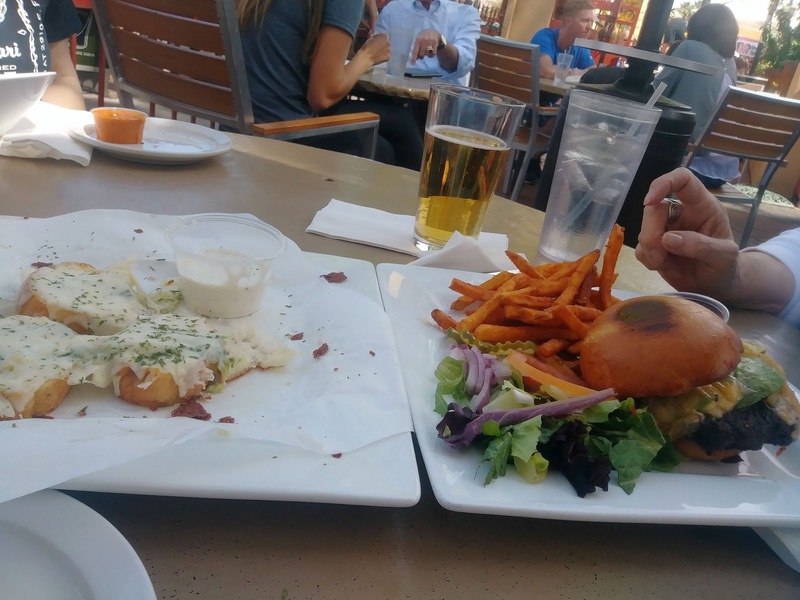 Before hitting some museums on campus, mom chomped down on a Winston Churchill burger that comes equipped with havarti cheese and sliced avocado. I got the Hen House sandwich, that includes chicken, bacon, house aioli, cheddar cheese and sliced apples. Always a pleasure that one is. Did She-Ra get soup? Probably. But of course we started out with the Frog Bites which is nothing but a sliced baguette topped with a garlicky pesto and mozzarella cheese. Its the pesto that makes this snack so endearing. So good. Mom got a Coors Light too. She likes Coors Light. What are you gonna do? 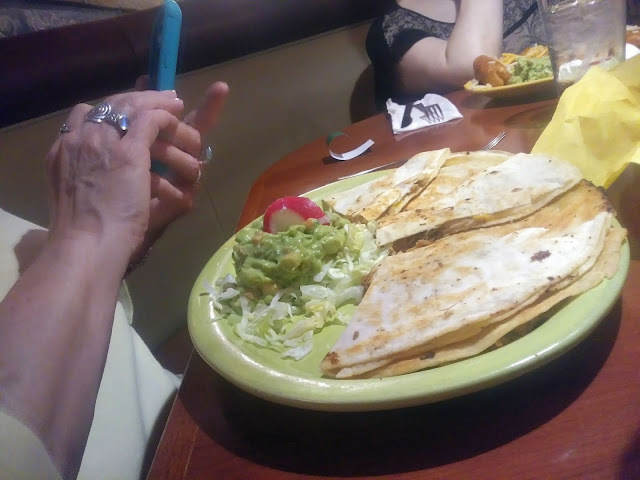 For my mom's birthday on March 19 we took her to our friend's family's restaurant Abuela's, which used to be the Old Pueblo Grille on Alvernon. Ironically, Abuela's just shut down after being open for less than 3 months so...I'll blog about that later. The food though has always been great so mom got 2 fish tacos and a big margarita. She seemed really pleased. If the food and tequila wasn't awesome enough, the staff brought my mom a chocolate mousse treat complete with birthday candles! How cool is that? We had a great time. Such a shame that the place shut down. But...I'll touch on that in my next post. Jason Scott, owner and pitmaster of BBQ Rush, that calls home inside of a KOA campground, liked my article about him so much that he put us all up in fancy cabins for the night. So the night before mom left we hung out in full 4 star log cabin style. For real these things are equipped with two separate bedrooms (mom got her own cabin thank you! ), full fridge, stove, gas grill on the patio and a fire pit. 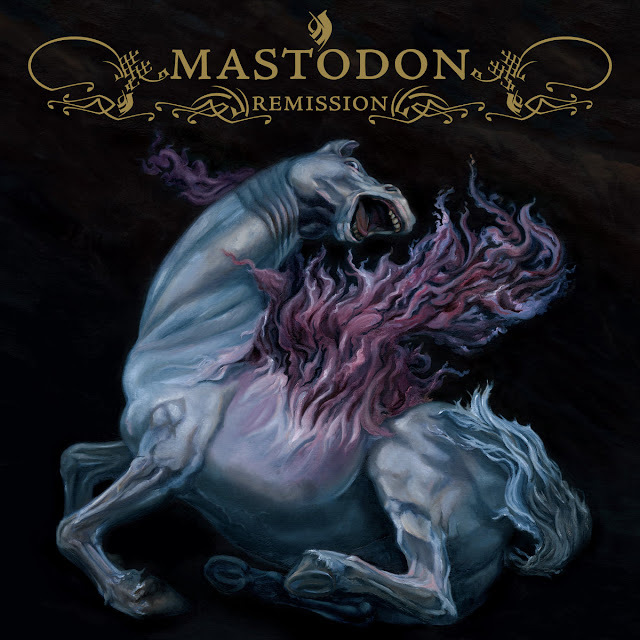 We weren't prepared for all this so we came bare boned. Next time we will arrive stocked up and ready to rock! 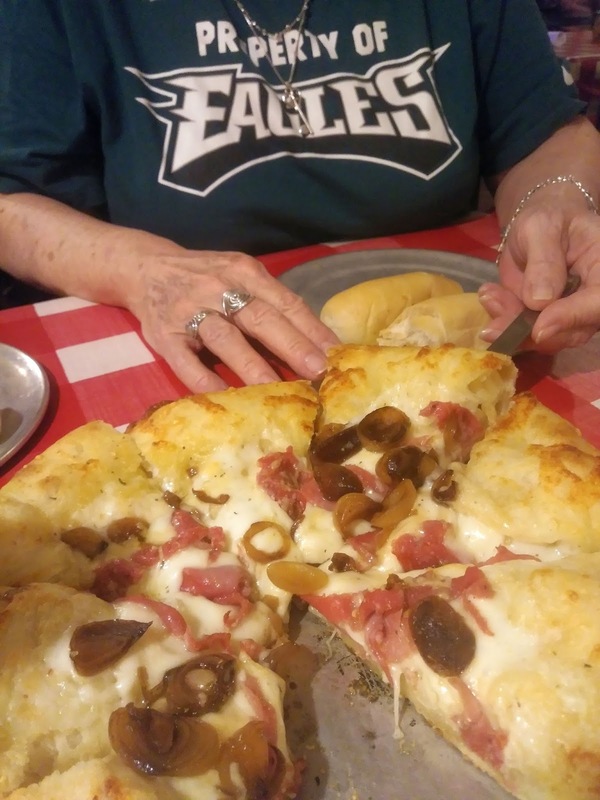 The next day, before putting mom on her plane headed to Philadelphia (PS: Can you tell she's an Eagles fan? Yeah.) Jason treated us to lunch at his restaurant. First he brought out a 'secret menu' item courtesy of Hellfire Pizza, that use his kitchen as their commissary, which was a BBQ pulled pork pizza. Oh man....incredible. We each had a piece because immediately after Jason brought out two slats of pure slow cooked awesome. Oh...muhgawd! This place freakin' rules. 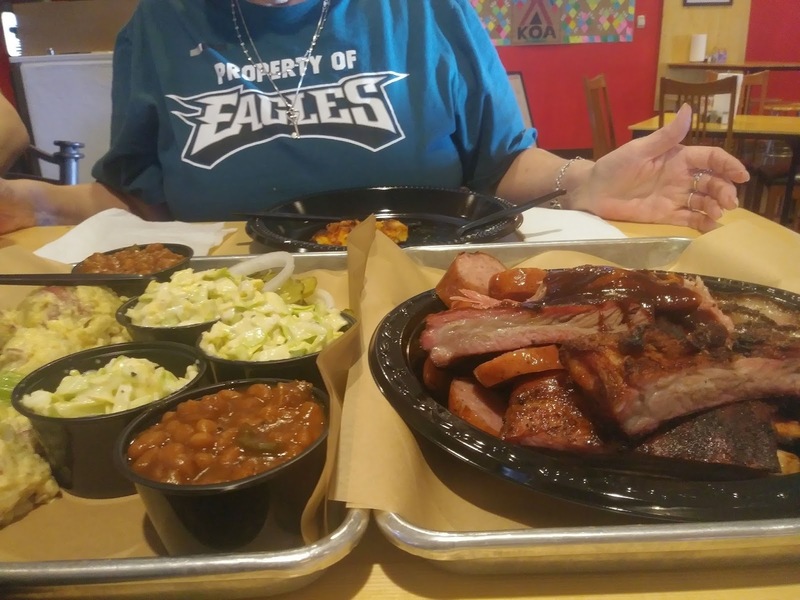 One tray was just sides such as house made potato salad, coleslaw, smoky BBQ beans and his incredible pickles. The other was a pile of meat: all night smoked brisket, pulled pork, ribs and hot links. Amazing. All of it, so good. To say the least my mom went into the sky in a near food coma. 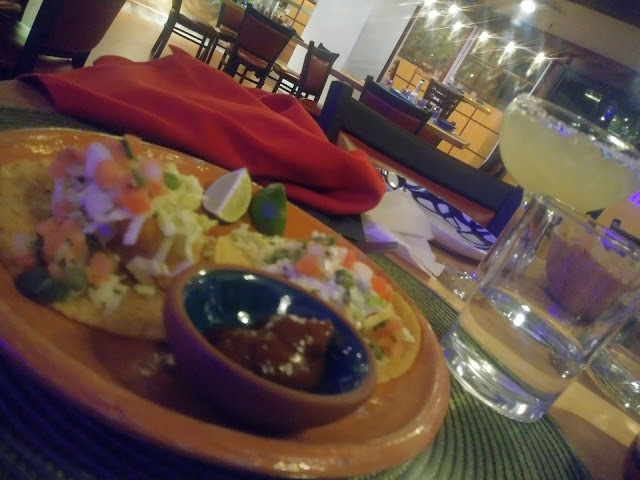 Apparently she had a great time and, apparently, the food here in Tucson beats out Wilmington Delaware on a scale of 1 to 10 tacos: We get an 11. So thank you Tucson for being so delicious, as always, and cheers for keeping my mom full and happy.